On June 2, 2010, the National Research Council (USA) released an updated edition of the Guide for the Care and Use of Laboratory Animals, which recommends standards and practices to research scientists and their institutions for the humane care and treatment of animals in research, testing, or teaching. You can browse and read the entire updated guide for free, through this web site. Finally, the new Directive of the European Parliament and of the Council on the protection of animals used for scientific purposes was officially released. The new European Directive (2010/63/EU of 22 September 2010 ) was published on 20 October 2010 in the Official Journal of the European Union (I. 276/33-276/79). This Directive will have to be progressively transposed to the National Legislations of all EU countries by 22 November 2012, so that on 1 January 2013 will effectively replace the previous 86/609/EC Directive on the same subject, with the exception of Article 13, which shall be repealed with effect from 10 May 2013. 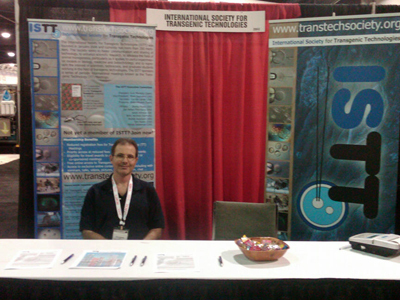 The ISTT was present at the recent 61st AALAS National meeting, held in Atlanta (GA, USA) on October 10-14, 2010. Jan Parker-Thornburg served as the official delegate representing the ISTT and its booth at the 61st AALAS meeting. ISTT is registered as an AALAS affiliate organization. Jan was helped by several ISTT members attending the 61st AALAS meeting, such as: Nancy Hitt, Fernando Benavides, Barbara Stone and Chip Hawkins. All of them are greatly thanked for their generous collaboration. Jan Parker-Thorburg has just prepared the corresponding meeting report, where she states: “Over 4000 people attended the meeting, and most spent time in the vendor area where the ISTT had its booth. The attendees are mainly composed of veterinarians and animal care technicians, with a few of us transgenic people sprinkled in “. Robert G. Edwards (Manchester, UK, 1925), from the University of Cambridge, Cambridge, UK, has been awarded today, October 4, the 2010 Nobel Prize in Physiology or Medicine, “for the development of in vitro fertilization“. Robert G. Edwards and Patrick C. Steptoe (1913-1988) performed in 1977 the first successful in vitro fertilization (IVF) in humans, resulting in the birth of the first IVF baby, Louise Joy Brown, in 1978. Since then, 32 years later, more than 4 million children have been born thanks to this IVF technique. IVF was not only developed in humans, thanks to Robert G.Edward’ s pioneer experiments, started in the late 50’s, but in rodents too. Several scientists, including David Whittingham, managed to obtain mice by IVF in the early 70’s. IVF is a powerful technique for the treatment of human infertility and also a tool for producing synchronized embryos of high quality in many species, such as mice. IVF methods are routinely applied in many transgenic units for producing embryos that are suitable for cryopreservation. Subsequent technical developments in reproductive biology, such as ICSI (intracytoplasmic sperm injection), have enriched the toolbox available to gynecologists and scientists in general for obtaining viable mammalian embryos.